RueLue: I read your question as: how to lay out a game record from a game file on a wooden board. As it seems, that you have an sgf file, I would suggest to use a screenshot of an sgf editor with numbered stones (but the ko stones cannot be seen on it). 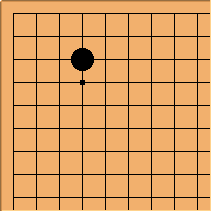 Some programs allow to export board diagrams to common grafic formats, which can be printed out (most of them don't show the ko stones). some programs can convert an sgf-file to another format. Try to find a program, which can convert to Ishi-format. Many Faces of Go vers. 10 and 11 (and 12?) can do this. This can be printed out and used to replay from the coordinates. Coordinates are 1 to 19 and a to t (no 'i'). This is, what could be found in old books, which your grandfather read. I just found: CompoGo (CompoGo homepage) loads an sgf file (double-click on the database entry of the game) and displays beside the board the coordinates like I know them from the Ishi-format, together with comments. You can copy the text to the clipboard, paste to a text editor and print out from there (maybe it is good to edit the text before printing it out, as it is all on one line). The SGF format uses a simple coordinate system in which letters are substituted for numbers. The first letter represents the column, while the second letter represents the row. Counting begins in the upper-left corner for both. It's clearer if you first think of the board as a grid of numbers. Begin in the upper-left, and number the columns. The leftmost column is one, the column immediately to its right is two, and so on. Then do the same for the rows. The top row is one, the one directly below it is two, and so on. To get the proper coordinates for a stone, first find the number of its column, then find its row. Finally, the numbers must be converted to letters. That is easy. Just count the letters of the English alphabet. Suppose you have a stone placed at a 3-4 point in the upper-left corner, closer to the top than to the side. It is in the fourth column from the left, and the third row from the top. So its numeric coordinates are 4,3. Now just change the letters into numbers. The fourth letter of the English alphabet is D, and the third letter is C. So the stone's position, in .sgf files is DC. Notice that you don't have to worry about skipping the letter I. SGF uses the letter I. So a stone played in the ninth column and the ninth row would be recorded as II. Sorry the diagram didn't turn out correctly. This is my first SL edit. See the page How To Record A Game. Some people use apps for laptop computers or smart phones.